When we had our house demolished and removed some months ago, its remains filled several trucks. A caravan of battered dump trucks were in turn filled, driven to some unknown grave site, emptied and returned. They worked until there was nothing left--nothing but a smooth, slightly depressed parcel of land, about 60 by 120 feet. Several of the neighboring houses have been similarly removed, summarily crushed and carted off until nothing remains but the shallow footprint of the excavated foundation. First, the people were evacuated, and then the houses were extracted. New Orleans post-Katrina is a canvass of minimalism. Whole streets like mine are still sparsely populated. Nearby businesses remain empty, flood-stained, untouched by man for more than 14 months. And every time a severely damaged building gets demolished, we celebrate the scene as a sign of progress. Vista Park, my neighborhood, is now speckled with vacant property. The former continuous rows of brick-veneer slab-on-grade homes nestled under shady trees are now interrupted by flat, empty land. And so to fill the shallow footprint, we had dirt placed on our lot this week. Trucks rumbled up near our FEMA travel trailer and dumped loads of clean brown sand onto our property. Perhaps they were some of the same trucks that had carted off the remains of our once beautiful home, a house reduced to the status of landfill by capricious nature. How much to fill the void? “60 yards, dump and spread,” the work order said. We’re not the only ones. Across from us and down the street, empty parcels have been filled with dirt. Not nearly enough to spare future buildings from another flood such as we saw with Hurricane Katrina—that is simply not practical. It is enough only to return the land to grade, to replace some of what was lost. Future houses will be elevated above the ground as required by code. Ours will be as high as that and then some. Demolition was an important step, akin to a doctor cutting out diseased and damaged tissue. But bringing in fill is the first proactive step in rebuilding this city. This dirt is the new land we will build on, the new foundation of the city. The labeling boom is the result of two powerful forces on the consumer market: government regulations and consumer litigation. Big Brother and Big Lawyer never seem to be satisfied. 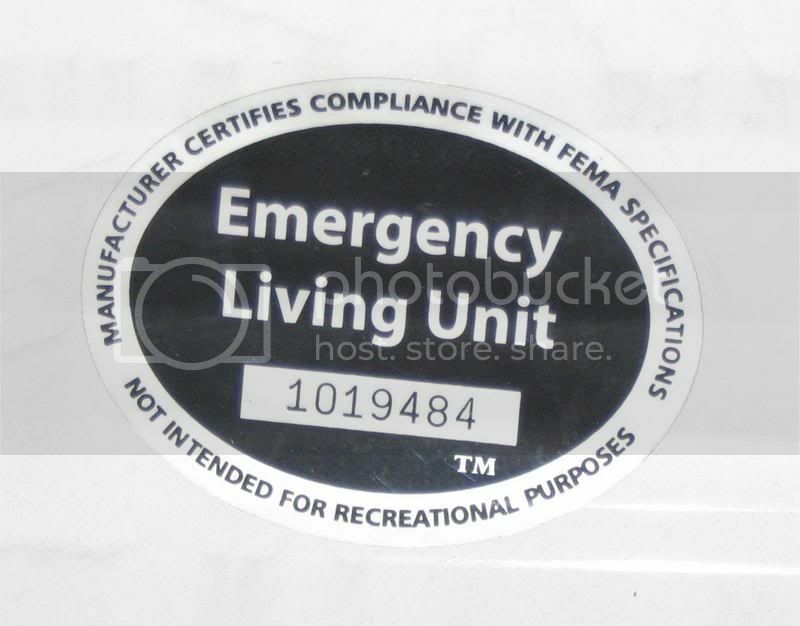 And so it should not be a surprise that our FEMA travel trailer is virtually decorated with warning stickers. This white box we call home is the perfect convergence of manufacturers’ CYA strategy and government’s “We’ll protect you” maternalism. It starts at the door. 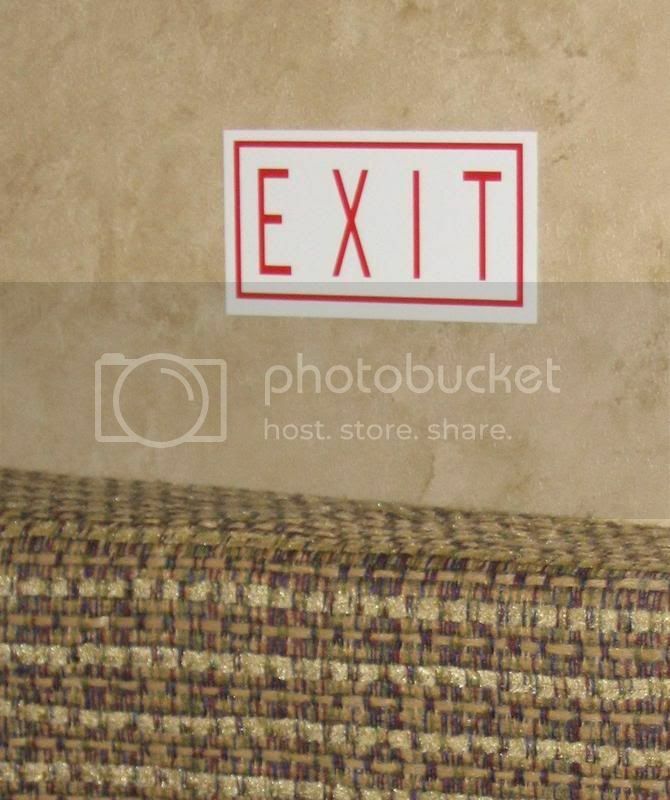 Above the door, the only exterior door, is the quaint “EXIT” sticker. I suppose it’s possible that in an emergency, an occupant might not know how to escape from the trailer and would benefit from this reminder that this door does indeed lead to the outside. I suppose in an emergency, one might become disoriented in the linear layout of the trailer—bedroom, kitchen, bath—and might forget which of the three doors allows escape. To add to the possibilities, every window is also a removable escape hatch, and so every window also is clearly marked “EXIT.” We are surrounded with possible escape routes—there are fully five “EXIT” signs in the just three rooms of this trailer. The trailer also has two smoke alarms and a carbon monoxide alarm. And every one of them has—you guessed it—a warning label. These detectors advise testing weekly. That’s surely overkill. 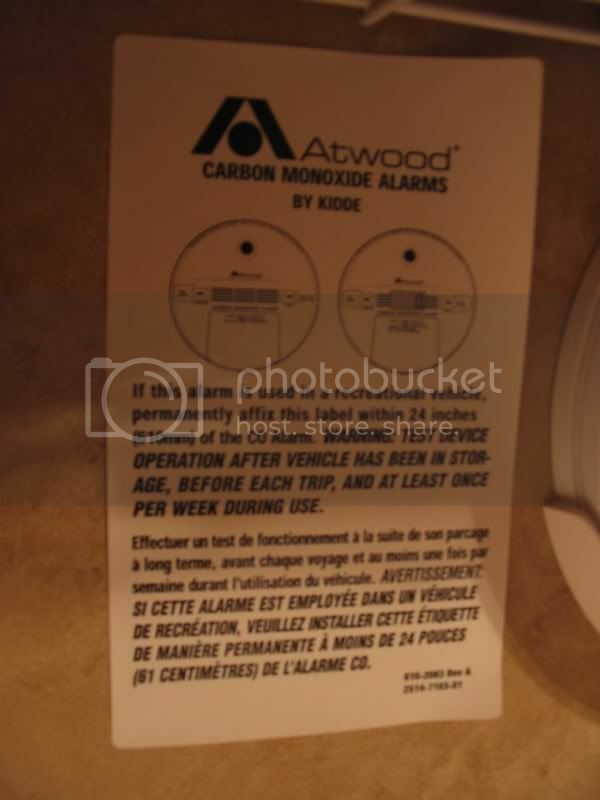 Battery-operated smoke detectors that I’ve owned and operated in the past always went more than a year before needing new batteries. Fire departments started to encourage changing batteries every time we change the clocks, upping maintenance to twice a year. But weekly? 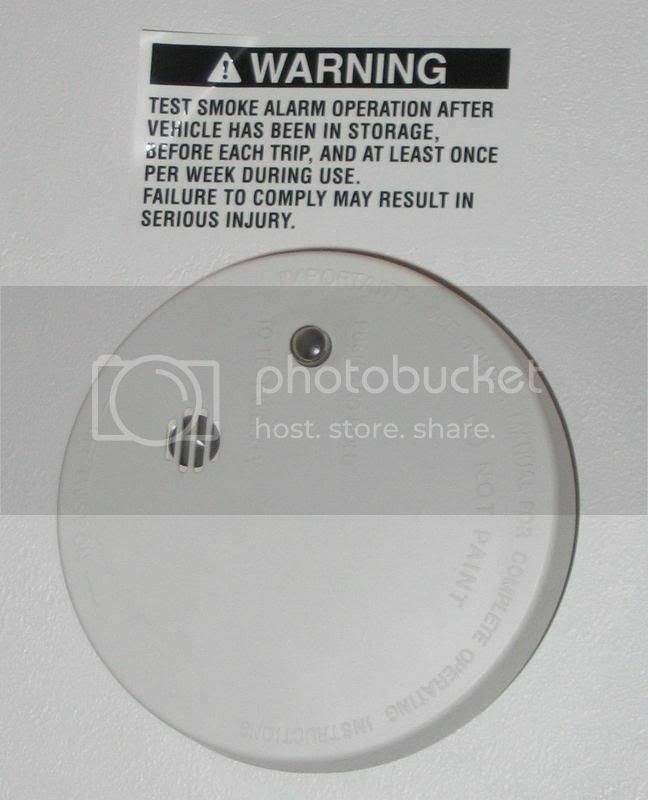 Are we being extra-super-obsessively cautious, or is FEMA buying the cheapest, most unreliable smoke alarms in the world? It turns out that this testing regimen is is not a problem for us, because we set off the smoke alarm every time we make toast. Oh, yes, they work alright… all too well! There’s also a small box with a little green light next to the oven that I understand is a propane detector. It’s the only appliance here that does NOT have a warning label. Poor little thing, I hope it does not have an inferiority complex as a result. 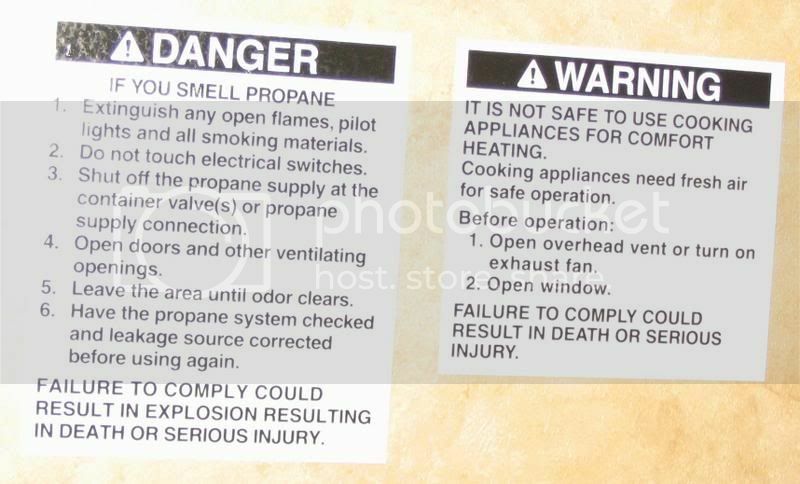 The stove is the most popular place for warning labels. Which makes sense since that’s where we use an open flame to cook. There’s a privacy curtain near here, one you would think is intended to give the illusion of a second bedroom for those using the bunk beds. 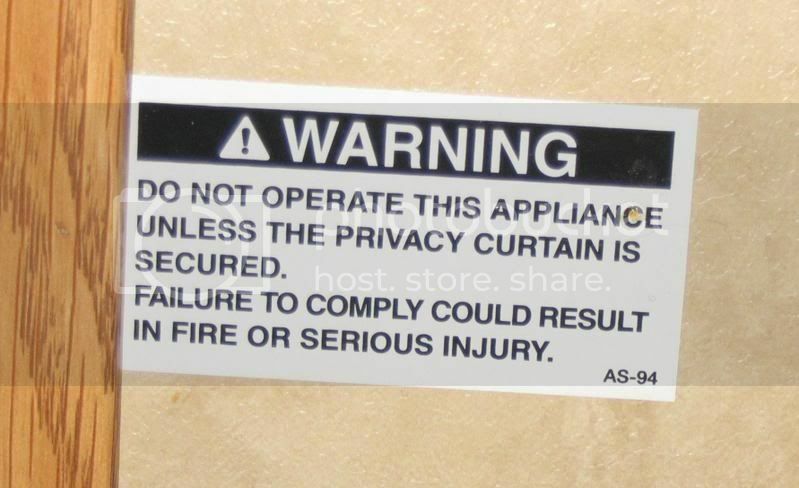 But according to the label pictured below, that curtain is also a fire safety feature. I would intuitively keep the curtain open and pulled as far away from the stove as possible while cooking, but apparently, that’s not correct. The curtain must be designed to shield the bunk beds and bathroom from fiery destruction. Who knew? 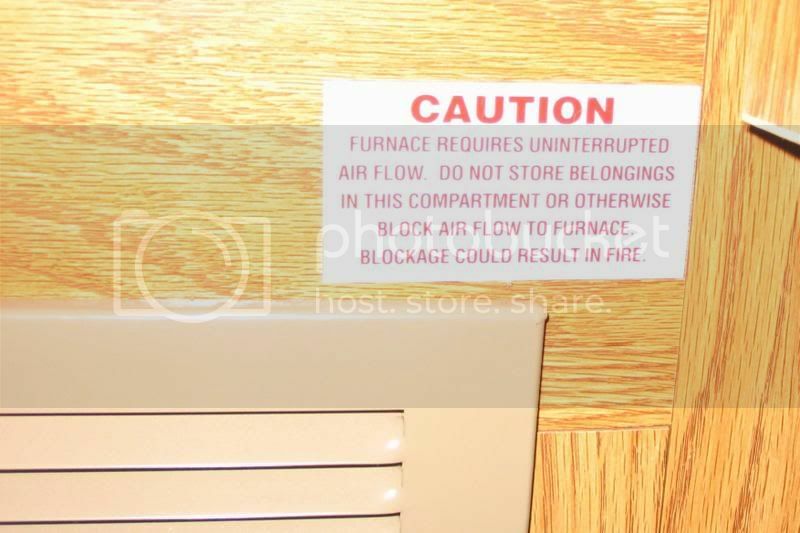 In studying these labels, I wonder if there is a seniority in the warnings they project. For instance, I notice some warn, “failure to comply may result in serious injury,” while others promise, “death or serious injury.” If there’s any rhyme or reason to it, the one by the stove wins with its “could result in explosion resulting in death or serious injury.” All that’s missing is a silhouette of a person in flames. And that’s most of them, but not all. Our friends in industry and government, acting in a combination of self-preservation and benevolent paternalism, have made sure we know about all the possible dangers that surround us in this cracker box abode. They’re clearly labeled every hazard with instructions and warnings of dire consequences to help us survive life in a travel trailer. Which is sure to make us feel totally safe. I know this because my Precious Daughter has marked it on our wall calendar. As I’m sure many schools are doing this month, and as I’m sure many of us did when we were in grade school, my Precious Daughter’s school, the International School of Louisiana, is having its own election on Tuesday. Representative democracy is a team sport: without full participation, everyone loses. 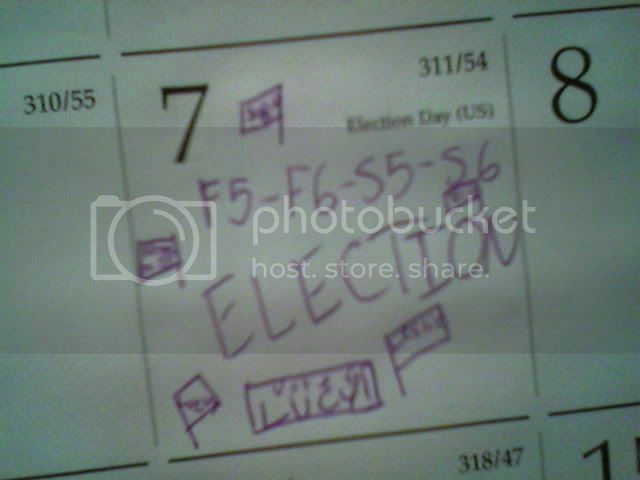 So I’m glad to see that ISL is engaging the kids in this election exercise. I know my girl is feeling very empowered by the ability to vote, to have a voice, to be the power behind government. She is the luckiest voter I know. She’s does not have to worry about why “Dollar” Bill Jefferson had a freezer full of cash, or whether Stacey Tallitsch is a “stay the course” fool or a “cut and run” coward. She does not have to wonder if promises made will be kept, or if money and favors will take the place of platforms and principles once the voting is done. She’s earnestly looking for someone who will represent her 5th grade class with care and dignity. And it’s not an easy choice. Everyone on the ballot is her friend, and everyone has personally approached her to ask for her vote. My Precious Daughter has shared some of her deliberations with me. To maintain her privacy and honor her confidence, I will not be naming names--not even under subpoena. I will only say that I am proud of the serious way she is approaching this election, even though ultimately I think we all know—even she knows—that it is just a game. Wouldn’t it be wonderful if those who vote for real had that sort of maturity? On a typical day, 388 billion gallons of water flow down the Mississippi River past New Orleans . It flows at an average rate of 600,000 cubic feet per second, but even those living here hardly know it. Lake Pontchartrain holds roughly another 2 trillion gallons of water, just outside your back door if you live in Lake Vista . If we didn’t know this before Hurricane Katrina, we most assuredly know it now: We live with water. In the FEMA cracker-box I call home, there’s a hot water tank under the kitchen sink. I am told this tank holds 4 gallons of water. That’s 4, F-O-U-R gallons. When I take my morning shower, I set the water to a comfortable setting, and then I adjust it every few minutes. A little less cold water, a little more hot water, a little less cold water, a little less cold water…until the cold water is turned off and I’m hurrying to finish before those last few drops of lukewarm water fall away to be replaced by cold water. A short walk from my lot is the infamous London Avenue Canal . This canal was constructed to convey rain runoff pumped from our streets to Lake Pontchartrain . On August 29, 2005, the canal embankments split in at least two places. Water from Lake Pontchartrain flowed up the canal and into our streets. When I was able to return to my house weeks later, I found a dead crab in my driveway. There’s a storm drain in the street right in front of my property. I keep it clean. For years I’ve swept and raked any leaves, trash or twigs that got caught in its grill. I still do this today. When it rains in New Orleans, these storm drains are sort of our “first responders.” I want them to work properly and unimpaired. Will it help keep my neighborhood from flooding? I tell myself it does. When floodwaters covered a great deal of New Orleans , there was a general warning not to drink water from the faucet. The entire drinking water system was suspect, even in the unflooded parts of town. I went back to work the day after Hurricane Rita came ashore, when much of the city was still a pond. We were drinking canned water at my office--silver aluminum cans of purified water. Every time I opened one, that cracking sound evoked a Pavlov’s response in my mouth as my taste buds got ready for the bitter-cool taste of beer. And every time, all they got was purified water. It’s an amazing feat that the Sewerage & Water Board was able to get the system up and running again so quickly after the storm. By mid October, water was safe to drink everywhere except New Orleans East and in the Lower Ninth Ward. Still, the city reported that there were so many breaks in the water system that fully half the water pumped from the purification plant each day was wasted. A few weeks ago, I fed the cats in our FEMA travel trailer as I do each morning. I put out a full bowl of fresh water for them. After my two cats ate and drank, I let them outside. A while later, I saw one of them, Smudge, lapping contentedly at a puddle of brown water in the street. I was shocked, angry and then worried in quick succession. But then I reminded myself, “She’s a cat. Cats drink dirty water all the time.” Perhaps at least in this way, cats have a superior survival skill to us humans. The human body itself is mostly just water. Wikipedia says about 72% of body mass in males and 68% in females is water. We live with water, we live surrounded by water, we ARE water. Sometimes too little, sometimes too much. It makes life pleasant and it makes life difficult. It makes life possible.